Our client provides affordable rental accommodation. This project was the third affordable housing project undertaken for James Brown Memorial Trust Inc by this practice. Upon completion of this project, 35 out dated flats had been replaced by 51 new single bedroom outcomes and $8m expended using a combination of client, State Government and National Rental Affordability Scheme funding. 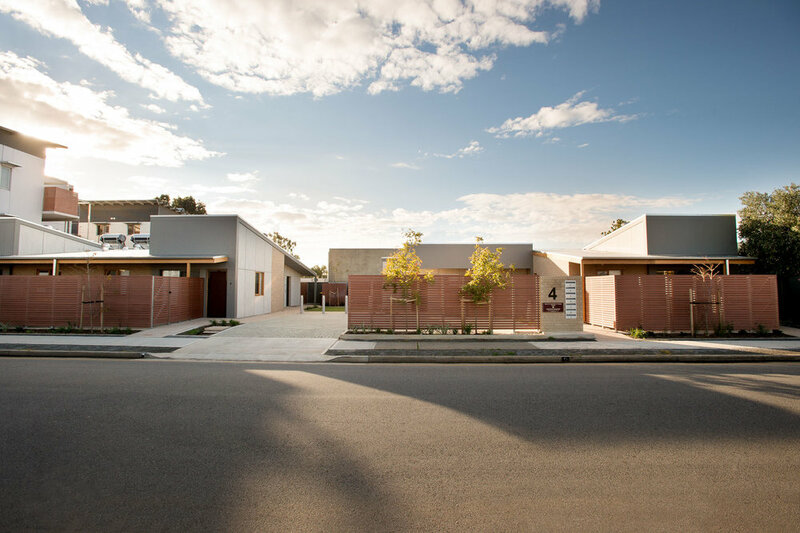 This small project involved replacing one row of four single storey pensioner flats, located on the north side of Winona Street, Findon and increasing the number of dwellings on the small site to seven. The replacement development consisted of new single bedroom dwellings in two single storey groups, separated by a common landscaped and car park area. Three dwellings face the street and four dwellings face north. The three dwellings on the south side have a north-facing portion to the living area. The land is located opposite a shopping centre and next to some recent multi storey residential accommodation. We considered it important that the project not be lost and therefore our design objective was for the development to contribute positively to the streetscape and locality. The design adopted height to the street as a means of achieving some street presence; our client required only single storey accommodation. The response was therefore to create a pattern of verandahs and parapets evoking the traditional attached shop and dwelling appearance to deliver visual connectivity between the shopping centre and our development, across a wide expansive suburban car park. With cost in mind, the external appearance was achieved with a reasonably simple conventional low-pitched timber framed steel clad roof form. Interiors are simple and robust. Windows are timber framed. For the project specialist advice and design input was sought from structural and civil engineer, landscape architect, services engineer and cost consultant. The estimated Construction Cost was $989000 excluding GST. Three selected tenders were received with the lowest tender of $895000 excluding GST being accepted. The buildings are constructed in reverse brick veneer on polished concrete slabs; our previous developments at Mansfield Park and Campbelltown for our client demonstrated this form of construction achieved high levels of comfort and also lower energy consumption. A north facing living area is provided to all units giving winter solar access with summer shading achieved through generous overhangs. There is good cross ventilation through all units and minimal western glazing. Rainwater is harvested and solar hot water is provided. Drought tolerant landscaping was also included. 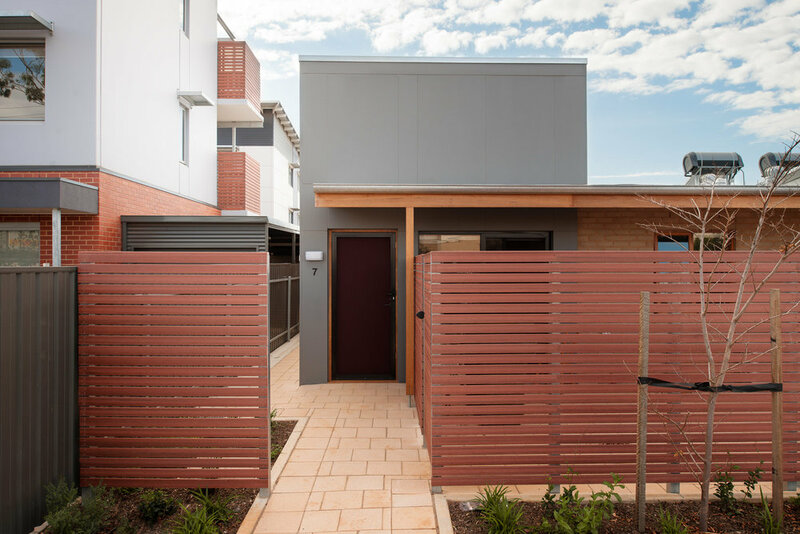 While the basic single bedroom module had been previously tested and fine-tuned over three projects the different challenge for the project was one of providing a small, low key residential development that responded to a commercial context, provided a contribution to the street and fitted within affordable rental housing cost parameters.